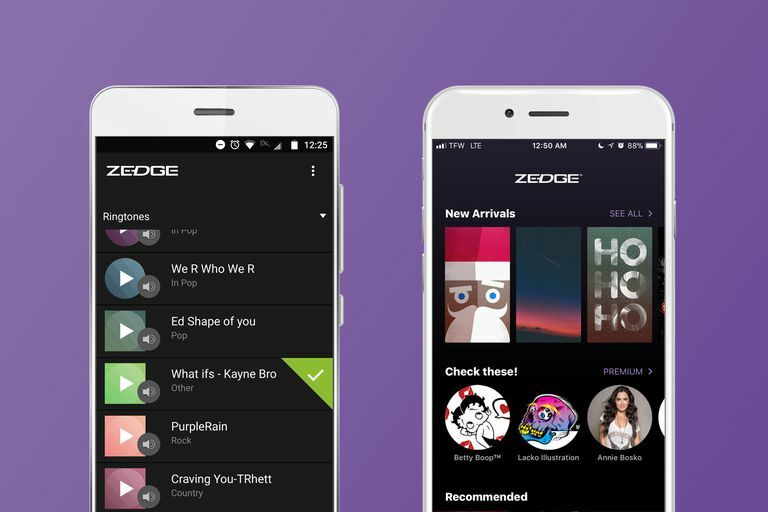 What Is the Zedge App? Zedge is a free app that provides a large selection of downloadable wallpaper, ringtones, live wallpaper, and other features to customize your smartphone. Zedge for Android offers wallpaper, live wallpaper, ringtones, games, icons, widgets, and keyboards to customize your Android smartphone in one handy app from Google Play. After you download the Zedge app and open it, you’ll be presented with a menu to select one of the options above. Let’s walk through downloading a wallpaper (background image). Click on Wallpaper in the menu. You’ll see two tabs toward the top labeled Featured or Discover. Clicking on the Discover tab allows you to browse by category or color. For this example, let’s choose the Sayings category. Scroll to find a preview you like and click on it to open it. If you want to go back to the previous screen, just click the X in the upper left corner to go back. To set it as your wallpaper, click the white circle with the download icon in the bottom center of the screen. This will give you the option to Adjust or Set Wallpaper. Click Set Wallpaper. Zedge will automatically download the wallpaper and change your wallpaper for you. What if you like the image but don’t want to set it as your wallpaper yet? You can click the heart icon to save it as a favorite or you can click on the three vertical dots in the upper right corner and select Download. Zedge will create a folder in your Gallery or Photos called Wallpaper and download the selected wallpaper for you to use later. Downloading a Zedge ringtone for your Android phone works in a similar way. Let's walk through downloading a ringtone. Choose Ringtones from the menu list. Again, you can browse through the Featured ringtones or click the Discover tab to browse by category. Let's click Discover. For this example, let’s click Country. You’ll see a list of country music ringtones to scroll through. To preview from this screen, click the play icon (triangle inside the circle). Zedge will load and play the preview for you. If you like the ringtone but would like to keep browsing, you can click on the heart icon to add it to your favorites. To download immediately, click on the song title to open up a screen for that song. You can also listen to the ringtone in this screen. If you are ready to download, click on the white circle with the download icon. You will be given the following options: Set Alarm Sound, Set Notification, Set Contact Ringtone, and Set Ringtone. Click the option you want to use and Zedge will download the ringtone and automatically set it for the option you selected. Again, if you would like to download it for later use, click the three vertical dots in the upper right corner and click on Download. Zedge will download the ringtone to your sounds folder for later use. Zedge: Wallpaper only. This app is also referred to as Zedge Wallpapers in the description of the other Zedge apps. Zedge Ringtones: Offers mostly generic ringtones, alarm sounds, tones specific to various phone brands (HTC, Samsung, iPhone), and sayings ringtones. To download any ringtone, the app requires you to plug your iPhone into the computer with the iTunes account for your phone. Some ringtones are free and some require payment or credits. Zedge Premium Ringtones and Marimba Remixes: Every ringtone previewed starts with several seconds of the standard Marimba ringtone before the song indicated starts, and the song clip is “remixed” to include Marimba through the entire ringtone. To download, the app directs you to the iTunes store to purchase the desired ringtone. Anyone with Marimba grooving in their soul will enjoy the Zedge Premium app. For the rest of us, we’ll stick with the Zedge Wallpapers version of the app for our iPhone example. Open the Zedge app. The home screen will bring up featured wallpapers and previews of the premium wallpapers. Along the bottom of the screen you’ll notice a home icon, a diamond icon for premium (paid), and the search icon. Click on the search icon to browse by popular searches, colors, or categories. For this example, let’s click on Pets & Animals under categories. Find one you like and click on the photo to open the full preview. Owls are my favorite so I’ll go with this beautiful horned owl. Click on the white circle with the download icon in the bottom center of the screen. Zedge will automatically download the image into an album called Zedge in your Photos. To change your wallpaper to the downloaded image, exit the app and go to Settings > Wallpaper > Choose a New Wallpaper. Scroll down the album list and click on Zedge > click on the wallpaper you just downloaded > choose Still or Perspective > click Set. Set will bring up a menu asking if you want to Set Lock Screen, Set Home Screen, or Set Both. Select the option you prefer and press your home button to exit Settings and see your new wallpaper. Zedge has tons of wallpapers to choose from for both iPhone and Android and a great selection of ringtones for Android. Browse around and enjoy customizing the look and sound of your phone!